Note: This column was published in the Barrow Journal on November 19, 2014. A Rube Goldberg machine is a complicated machine that performs a simple task. Two years ago, I found a video of a very enthusiast little boy who made a Rube Goldberg machine and posted it online. I loved it so much, I shared it on my blog. My son and I watched it several times, and it never failed to delight us. Audri’s excitement is infectious. At the time I thought my son would probably like making one himself, but he was only six-years-old, and I didn’t say anything. If it were my idea and not his, it would surely fall flat. Besides that, I wasn’t sure I could even make one – they seem complicated! Fast forward to late last week when my five-year-old wanted to show me what he made. I went into the living room to find that he had set up several items, and he showed me how a ball would go from one item to another and knock them over. Nothing was actually attached to each other, so I knew it wouldn’t work. He was just pretending and walking the ball through the course. After he demonstrated this to his brother and me a couple of times, I told him he might want to watch Audri’s video. My eight-year-old could remember the enthusiastic little boy and that machine, but my five-year-old did not. So I found the video, and they both watched it several times. It was just as exciting as the first time we saw it. 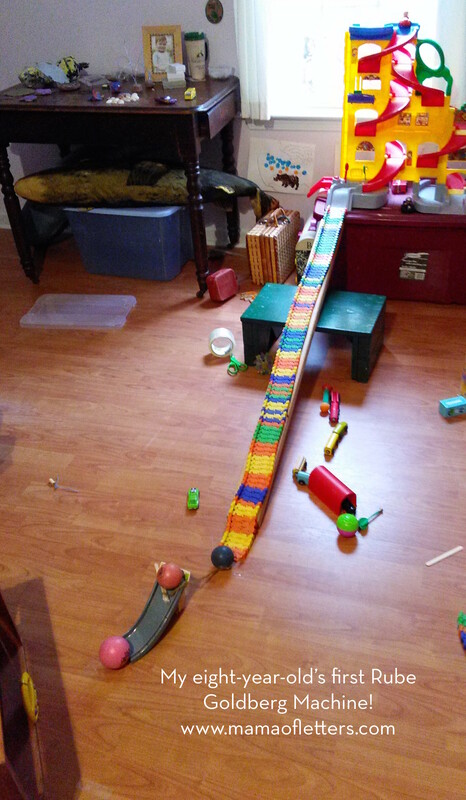 After that, my eight-year-old said he wanted to make a real Rube Goldberg machine. I said okay, and we dedicated this past weekend to making the contraption. I did my best to let my son make all the decisions. I kept my mouth shut even if I knew he would fail. And fail he did. His first idea was to use his scribble bot (a lightweight robot that moves some pens around on a piece of paper) to knock a heavy ball off a table, and that was supposed to knock a bottle of water over and into a funnel. The funnel was attached to a pipe and the water was supposed to go through the pipe and eventually come out where a pinwheel (which was spinning because a fan was blowing on it) would carry that water over into a bowl. As you can imagine, there was a lot wrong with this machine, but my only request was that he do it in the kitchen where I knew the water wouldn’t hurt the floor. There’s so much to be learned from failing, and my son was having fun. He was thinking, problem solving, and trying things out. It didn’t take him long to see that nothing quite worked right and using water wasn’t a good idea. My husband suggested he use a ball and gravity, and my son agreed. At this point my son also wanted to look up some other videos of Rube Goldberg machines to get ideas, so we spent some time doing that. While watching the videos, I told him to think about what those machines used that we also had on hand. We don’t have pulleys or dominoes or large equipment, but we do have toy tracks, lots of balls, blocks, pieces of wood, string, popsicle sticks and other small items. I suggested that we take all these materials upstairs to our big room and look at them and see if it inspired anything. At this point, it was getting close to lunch, and my son’s patience was waning. He sat in the room and fumbled around, not accomplishing anything. As he gets older, he is getting more patient and realizes that it takes time to build things, but that doesn’t stop him from getting frustrated or fussy. He wanted more of my help, but I knew at this point I’d just be taking over, if I did that. Instead, we opted to have lunch and try again the next morning. The next day after breakfast, we were both fresh and ready to build this machine. I reminded my son that using gravity – starting from a high point – would help a ball gain momentum, and I reminded him that whatever we put into motion had to hit something else and put it into motion. I reminded him how in the videos we watched, sometimes a ball would pull a string, which would release another ball, etc. I got him started by putting a spiral racetrack up on a box and connecting that to a ramp. The little car hit a ball at the end of the track and sent it down a ramp. It took a long time to set up his last three steps – the ball hit another ball tied to a string. That string pulled away a popsicle stick and released another ball down a slide. That ball hits another ball that then rolls across the floor to hit and ring a bell. It’s not a long, complicated machine that you might find if you search for Rube Goldberg machines on YouTube, but it’s my eight-year-old’s first Rube Goldberg Machine. After much trial and error, he finally got it to work, and during the process I heard him say, “If it doesn’t work, just try again.” Yes! He may be happy with his machine, but I’m happy about what he’s learning through this whole process. How fun! I love these. I think I was always enamored with the idea myself. I’m not sure I ever got past dominoes in a line! Thank you for the comment, Tracy! It was great fun. I hope he will continue to improve on it! Thanks, Carolyn! I’ll tell him you said so.